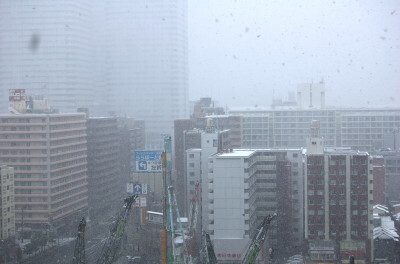 Well, I awoke this morning to see that Tokyo is getting it’s second bout of snow of 2008, at least where we are. It’s still going now at lunch time, and though it’s not settling on the paths or roads, it does seem to be piling up around the sides, on roofs and the local building site (come on, everywhere in Tokyo has a local building site doesn’t it?). Always a good day then to have to run errands on the bike! It reminds me we really need to sort out a couple of snowboarding weekends. Upon further thought, it also means I wont be able to take our daughter to the park in all likelihood, so maybe we’ll go to the Akachan Tengoku instead.